Today is Adopt a Family Member Day! I did come up with some items for a sale. Yee Haw! 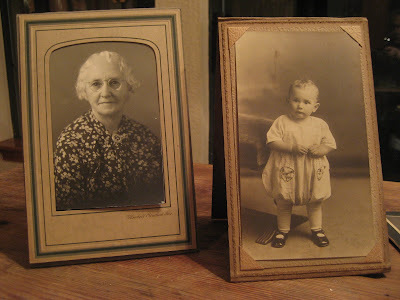 Swing on over to the flickr page and pick up a child, a grandma and new cousins! Make your selection and email me at PrimitiquesNPoetry@yahoo.com . Upon knowing the shipping amount, I will invoice you via paypal some time Monday. Easy pricing. Every single thing is $4. Yup. $4 each regardless of size or framing. Some of these have writing on the back. I laughed at one; on the back is written "Will-Grace-Harry-Carrie"...Cute. If you want more pictures or measurements, holler. Be sure to head over to Margo's for her online garage sale today. And Cindy is having a garage sale, as well! Okay, now you're talking! I collect vintage photos! I definitely want the photo with the dog in it! I also want the photo in black mat with little boy with white tie. And I want the little girl standing up with a bloomer looking outfit on. Does all of this make sense? I would like to see the photo with the group of four or so children...it is in a group with three other photos. Can't see it well. These old pics are really great! Wow..an online garage sale..that is so fun. I'm not usually on during the weekend but always enjoy catching up on your goodies. Love old photos!